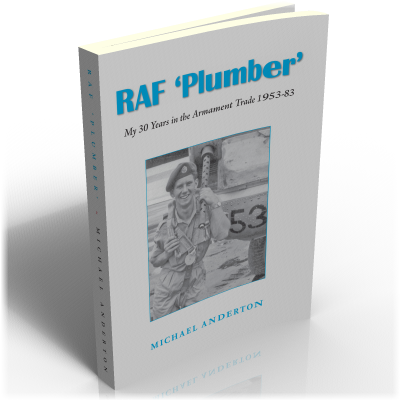 In this entertaining memoir Michael Anderton looks back on his 30-year career in the RAF as a ‘plumber’ (RAF slang for the trade of Armourer), during which time he packed in a wide variety of experiences, both at home and abroad. After training at RAF Halton, Michael served at various postings in the UK and overseas, including RAF Tengah (Singapore), RAF Maintenance Base Safi (Malta), No.5131 Bomb Disposal Squadron at RAF Stafford, RAF Wildenrath (Germany), RAF Coltishall, RAF Akrotiri (Cyprus), and the Missile Servicing Flight at RAF Wattisham. In the course of these postings he had many interesting and unusual experiences, which he shares with his readers in the course of this lively and well-written account. Delivered in a good-humoured style that is always enjoyable to read, this book contains plenty to entertain any reader, but will, of course, be of particular interest to Mike’s fellow RAF ‘plumbers’ , who will doubtless have shared many similar experiences.